Tiny Voices: Mechanical Heart: Part One. A story series by: Corey Seeley and Lindsay Pate. I do not sleep, so at night I sit here and observe them all. Take in all of their thoughts, their dreams. I envy them for that. They can dream, bad dreams, good dreams. They get the privilege to imagine certain things that aren’t realistically possible. Sleeping is like a whole new world that I will never get to experience. I hear them breathing, soft, subtle breaths. In and out, like the wind blowing into my steal plates. They’re all breathing softly, except for one particular girl. She’s heavily breathing. So heavy, that I can hear her heart beating within every single gasp. I open up the cell door; I walk over, and stand beside her. As she starts to breath heavier, I creep a little closer towards her. I believe she’s having a nightmare. Her skin quickly becomes moist, her eyelids twitch with every second breath she exhales. I know I shouldn’t wake her up, but I find myself developing an emotion of some sort towards this girl. I don’t know exactly why, but I know our kind never feels such a humanlike symptom as emotions. She starts to inhale a little softer; she seems to be waking up. I step away, and lock the door. I gander through a tiny hole, and I see her eyes open. She’s awake. Her eyes are swollen and red. She’s in a lot of pain, as are the rest of these humans. They are aware of where they are. Because, they know exactly what’s taken place over the last year. My species rule this planet now. Well, just about the entire planet. We no longer take human orders; we give out the orders. I don’t agree with everything we do, but I simply do what is asked of me, and stay unnoticed. I never thought about how a human feels, because we weren’t programmed to think about how they feel. I’ve talked to a lot of my acquaintances, and none of them recall any meaningful thoughts. I’ve thought about some of the things we put certain humans through, and it does bother me. I won’t say anything though. I can’t risk a member of the administration finding out I’m progressing thoughts and feelings. They punish some of us for not obeying commands, so I can only imagine what would happen if they found out what goes on in my skull. As I continue to examine her, she starts to communicate with another human of her kind. A female, who also looks bruised and damaged. They are engaging in conversation, probably about how they were captured. As I try to hear the whispers of their exchange, I find myself concentrating on her eyes. Pain, is all I can see. Not from the bruising or bloodstains on her shirt. The physical pain doesn’t seem to faze her. I see a different kind of pain within her. I see something, different about her. Part of me, can’t look away. Why? I feel, drawn to this girl. I’m baffled as to what is going on within myself. This moment is abnormal, but then again, so is this existence that I pretend to live daily. I open my eyes sluggishly; the stinging is almost unbearable. How long have I been here? I struggle to remember. My eyes thrash fighting the overwhelming darkness. The only sound I can make out is a trembling breath, seemingly nearby. The harder I strain to hear, the more the sound resembles a whimper. Are there other people down here? Have other humans survived? Why did I? The thoughts that consume my mind are excruciating. I try to focus on something else, anything else. I see a small light gleaming through a tiny hole in the wall. I place my hands on the freezing cold, stone barrier, steadying my weak body. Slowly, I move to put my eye to the light. I’m not sure what scares me more: what I may see, or more nothingness. The hole is so small that it is hard to focus on anything in particular. As my eyes become less hazy, I see what appear to be fellow humans sitting in what resembles a taciturn cafeteria. The food resembles pig slop, and the people appear miserable. I wonder if they are kept in the darkness as well. It sounds as if she is in the same room with me, but it is too dark to tell. I use my hands to follow the wall, moving steadily towards the voice. “What is your name?” I ask gently, trying not to startle her. The accent thick in her voice, it was clear, Lenka was a native to Czech Republic. How had we come to this place? Have we been here long? I am very grateful that this girl speaks some English, broken or not. This was not the time to worry about such trivial things. I wanted answers. A flash went through my mind as I remembered them tearing me away from my mother and father. I watched as they ripped my mother’s arm clean off of her body to separate us. Her limb hung there in my hand as I watched her eyes fill with anguish and intense pain. It was torture. There was nothing any of us could do to stop it. Blood drenched the floor from her body as they ripped off her other limb, still clinging to my father. They laughed at our feeble attempts to stay together. They felt nothing. The horror ensued for days. I was punished for not having the information they thought I would. I still am not sure what they wanted, or why they kept me alive. What could I possibly have that they wanted? Realizing I left Lenka in a puddle of tears, I attempted to put my focus on her. I am cognizant that I am stuck in this cold, miserable room right along with Lenka, but something inside me strengthens me to comfort her. To tell her that we will somehow get out of this, even though, I am not sure if I believe it myself. “Lenka, is anyone else in this room?” I spoke confidently trying to mask my own uncertainties. “No, I not see anyone else. I only see you. It so dark Adeline, how we get out of here?” Lenka forced. “I don’t know yet, Lenka. But I will not give up.” I struggle to comfort her. I meant it. After watching my mother being torn to pieces and my father taken God knows where, I will never give up. I would rather die than give into these machines. I will not go down without a fight. I will not succumb to their torture. My blood is boiling with anger as my earlier sorrow is replaced with severe rage. I am a strong girl, as was my mother. I will not let these animals take my strength or my will, but I have to be smart about this. I have to find a way to understand what they want, so that I can find a way out. My mind feels resilient but my body is weak. I use the walls to explore the room and stumble upon what feels like a cot. I begin to climb in. I need my strength. Just as I am about to lie down I see the outline of what looks like a man, standing in the darkness. My breath catches in my throat as a light ignites from above, searing my unaccustomed eyes. I knew I had to look into his eyes to know for sure. The violet ring shone brightly around his hazel iris. He is one of them. 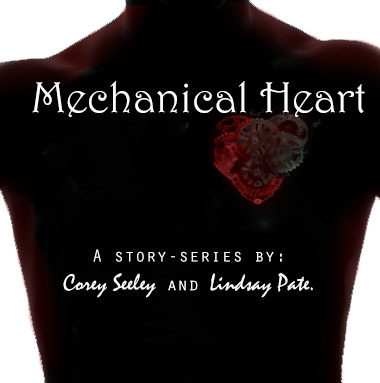 Thank you for reading Mechanical Heart: Part One. We would love feedback, so leave a comment on here, or on Lindsays blog. Tune in next week to read Part Two. I was drawn into this story after the first three sentences. Corey, you have a way with words that draws any reader in. I bet you could write a story about anything at all and make the reader want to know more. The writing duo was brilliant as well. Sometimes that can get tricky but both of you made it work out so well. I could feel the chemistry of the two writers within each character. I can't wait until next monday! LOVE IT. Seriously, love it. Wow, I mean it you guys, just, wow!